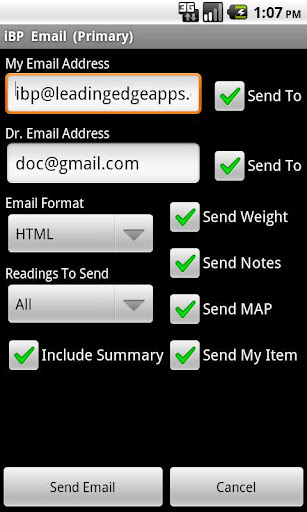 Here at iMedicalApps, we have mainly been focusing on smartphone apps designed to be used by the health care provider. However, patients on the receiving end need attention, too. 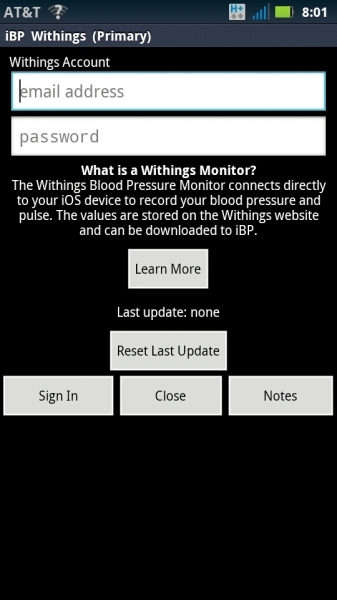 iBP Blood Pressure from Leading Edge Apps is a blood pressure tracking app specifically designed for patients. There are numerous blood pressure apps on the market today and we have previously reviewed the Android app, Blood Pressure Report. 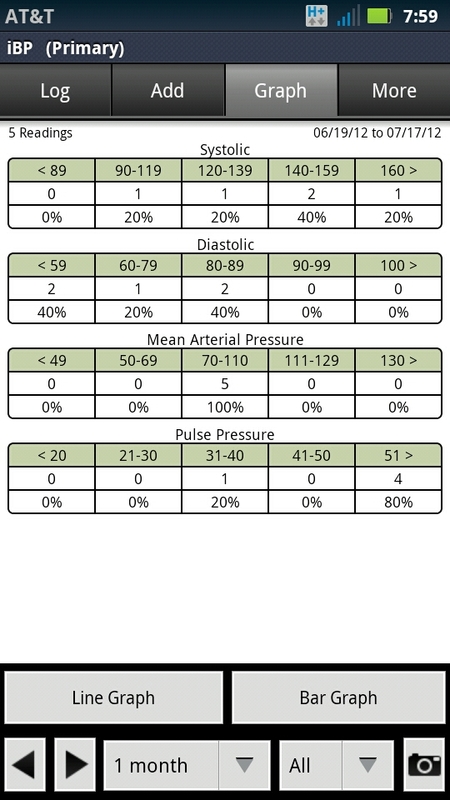 In this review we take a look at how iBP Blood Pressure fairs in comparison. I am personally a strong supporter of smartphone technology to improve medical care and information collection and, in my opinion, these health tracking apps should be recommended to patients by doctors whenever possible. Having such apps, I believe, will not only promote active patient participation, especially for silent diseases such as diabetes and hypertension, it will also allow the health care provider to treat their patients much more efficiently and effectively. There are currently 50+ blood pressure apps on the Google Play market, and each one has their own strengths and weaknesses. 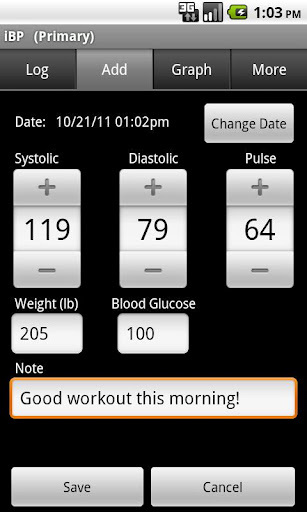 I recommend that health tracking apps be handpicked for each individual patient. Some patients may prefer detail oriented apps that include more data collection options which may otherwise be too overwhelming and tedious for others. 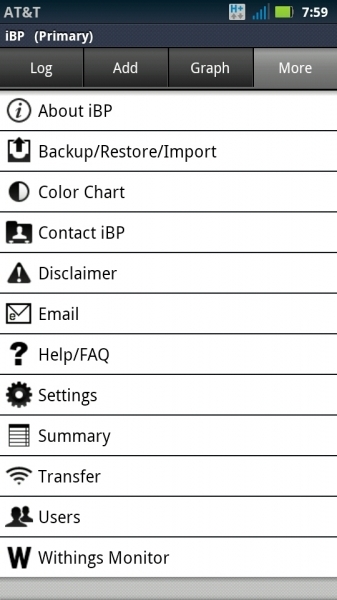 iBP Blood Pressure is a simpler app that is straightforward and easy to use compared to some others on the market, and is definitely a good choice for patients who would rather not spend too much time on their phones inputting data. The main goal of this app is to assist the user in monitoring and documenting his or her own blood pressure over time and share that information with their health care provider. The interface layout is clean and clear and the information shown is easy to interpret. 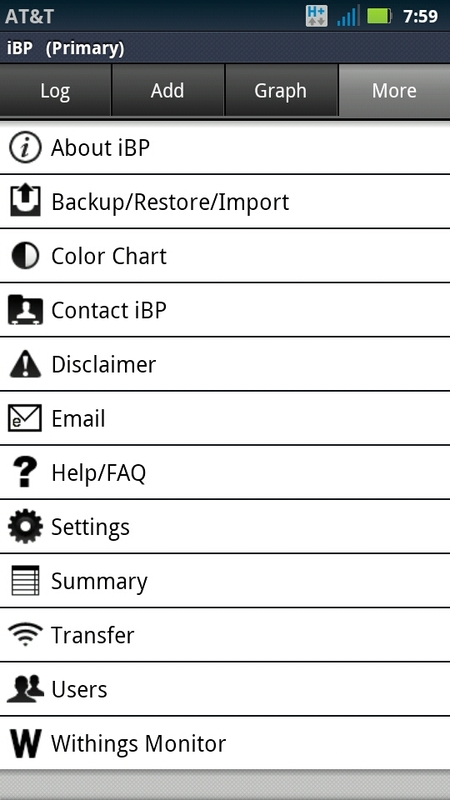 When loading up the app, you are immediately presented with a list of all your recent inputs or “Logs,” which are conveniently color coded according to how normal or abnormal the user’s pressure readings are. 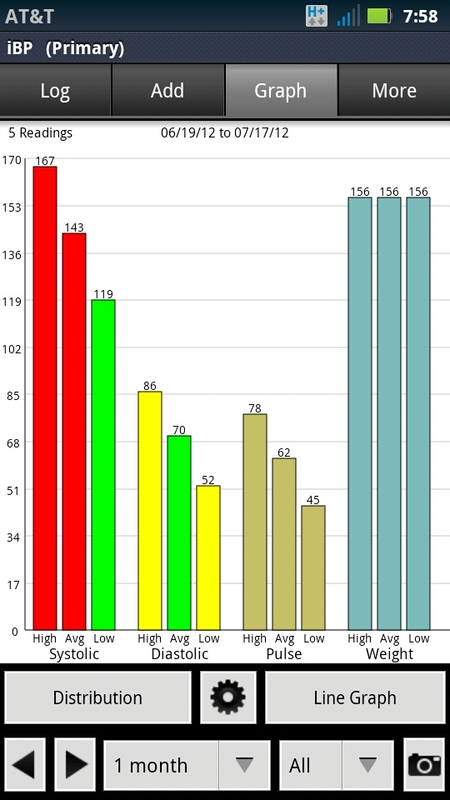 Fear not, for those who do not like the colors green, red, and yellow–the colors are customizable. 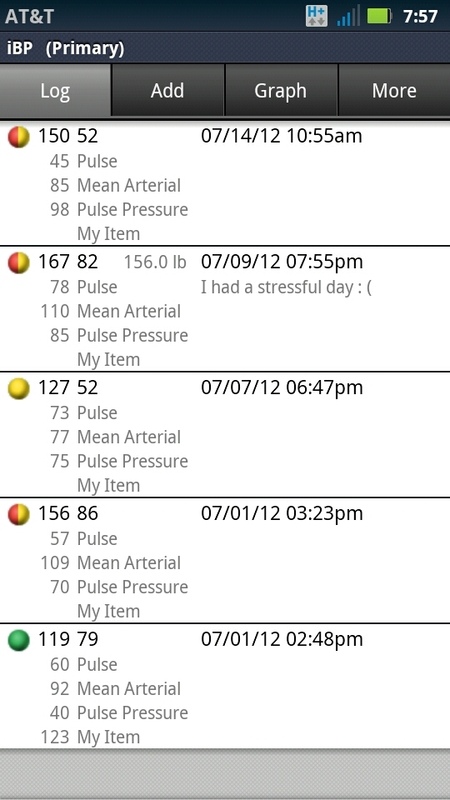 Switching over to the “Add” tab, large input fields are displayed for date, time, systolic pressure, diastolic pressure, pulse, weight, and a customizable “my value” field. A real advantage of this app is the inclusion of a “Notes” section, which allows users to document any special circumstances in which the blood pressure was taken. Having the versatility here is definitely a plus, especially given the complexities of our daily lifestyles and bodily responses. 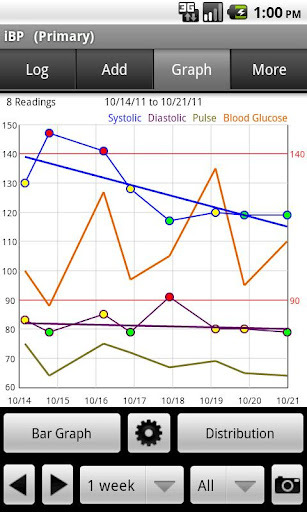 Next, “Graph” view presents your data in either linear, bar, or table distribution formats. 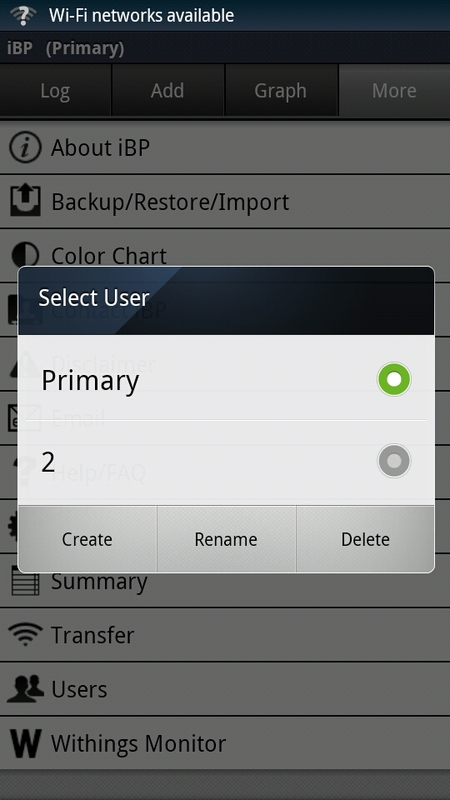 Like almost everything else in this app, you can customize the presentations to include data over 1 day up to 1 year. You may also filter your data by AM logs or PM logs. Snapshots of these graphs can be taken with a conveniently located camera button at the bottom corner to convert your information into more manageable image files. The options and functions provided under the “More” tab is where the goodies are! To name a few, users can customize app settings, create multiple accounts, backup their data to their SD card, synchronize with other devices, and forward data via email to themselves or their physicians. Last but not least, the app works well with “Withings” accounts, which are free to register (“Withings” is an online service that collects and tracks health related information such as blood pressures and blood sugars either via their website or from other services or products such as iBP Blood Pressure). With the addition of this online service integrated to the app, users need worry about old data being lost or about transitioning to another device in the future, as long as the new device also has “Withings” supported services. The only downside to this app that I have noticed is the inability to document medications that one may be taking for hypertension or other ailments. 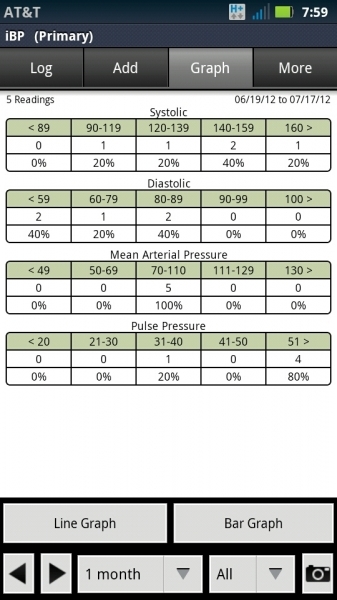 Perhaps the “notes” field may be helpful with this problem, but you are not allowed to input data without a blood pressure reading, which limits the “notes” use for this specific purpose. The ability to monitor blood pressure in response to medications may provide the health care provider substantial information regarding the medication’s effectiveness, which is another important aspect of hypertension care. This data will also clue the health care provider in on medication compliance in the appropriate setting as well. Clean and Concise UI, gets the job done quick and easy. Additional “my value” and “notes” fields added to data logging. Multiple data back up and transfer options avaiable. Synchronization with multiple other devices. Multiple accounts allowed on one app/one device. Inability to log medications separately. Not only does iBP Blood Pressure monitor blood pressure extremely well, but it also provides a wide variety of functionality at the same time, while not compromising its simplicity and user friendliness. Everything is always presented in a very clean and straightforward manner. Using the app itself requires little of the user’s time, allowing them to resume their activities promptly. Perhaps lacking the ability to input medications is a downside, but at $0.99, iBP Blood Pressure remains outstanding and really shines compared to its competitors. Thank you for this review. I have been trying to find the best BP tracking option for some time now but there are so many of them! I had actually settled on this one before reading your review and am happy to see that someone knowledgeable agrees with me.